Same year, just a few months later. Any one of the soccer matches played in the 2010 World Cup. A forward gets tripped by a defender from the opposing side. He falls, flops around like a carp on the shoreline, grimacing, holding his shin and beating on the ground. Medics rush out with a stretcher, hover over the downed player for a minute or three. He gets up and, lo and behold, all is well. The medics rush off the pitch and play resumes. “That,” said my hockey-loving friend, “is why I don’t like soccer.” He’d just given me the stark comparison in response to my argument that hockey players, if no one else, should appreciate the world’s game. The games are so similar – nets, goalies, the need to sometimes move backward to get moving forward again. It’s World Cup time again. People around the world are going nuts, painting their faces, taking holidays to watch their national teams play in Brasil. Through it all, I’ve been thinking again about why soccer isn’t more popular here. The sport has made gains in the USA in recent years and, of course, it’s spiked over the past month. Compared to the rest of the world, though, it’s is a bust here. Why? There are many theories. One is that it’s Madison Avenue’s fault; advertisers aren’t interested in sponsoring matches because there aren’t enough commercial breaks. And, since it’s not on TV, the argument goes, we just don’t know what the game is all about. Another is that there isn’t enough scoring, and Americans are spoiled. We want to see the payoff now, and again in a few seconds or minutes, and then again…. Search “Why Americans Hate Soccer” and you’ll find a bajillion blog posts that claim to have the answer. And on most it comes down to The Flop. Despite my hockey friend’s suggestion, these players, men and women, are not meek or weak. They are not wimps. Have you SEEN these guys when they take of their jerseys to trade after a match? Can you say eight pack? These athletes and their female counterparts are animals who run for 45 minutes straight, no breaks. Except when they flop. The Flop is, and always will be, part of the game. It’s a tactic for getting teammates a short break and some water during a grueling match, or for running some precious (to the other team) seconds off the clock when your team is ahead. But for most Americans, it’s repulsive. The Flop goes against more than two centuries of grind it out. Walk that off, we say. Never, ever, let the other guy see he’s hurt you. When the going gets tough, the tough get going. Up an’ at ’em! Get back on the horse. Gimme your best shot. Rub some dirt in it. Tough it out and play on. That’s my advice to world soccer for getting more love in The States. And then I remember: they don’t care. Futbol is The World’s Game, not ours…yet. 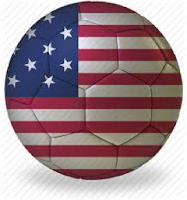 As we gnash our teeth over The Flop and other theories as to why more Americans don’t like soccer, the rest of the world is enjoying the game.